Giveaway alert!!! Looking for healthy delicious snacks? I’m giving away my favorites HERE! 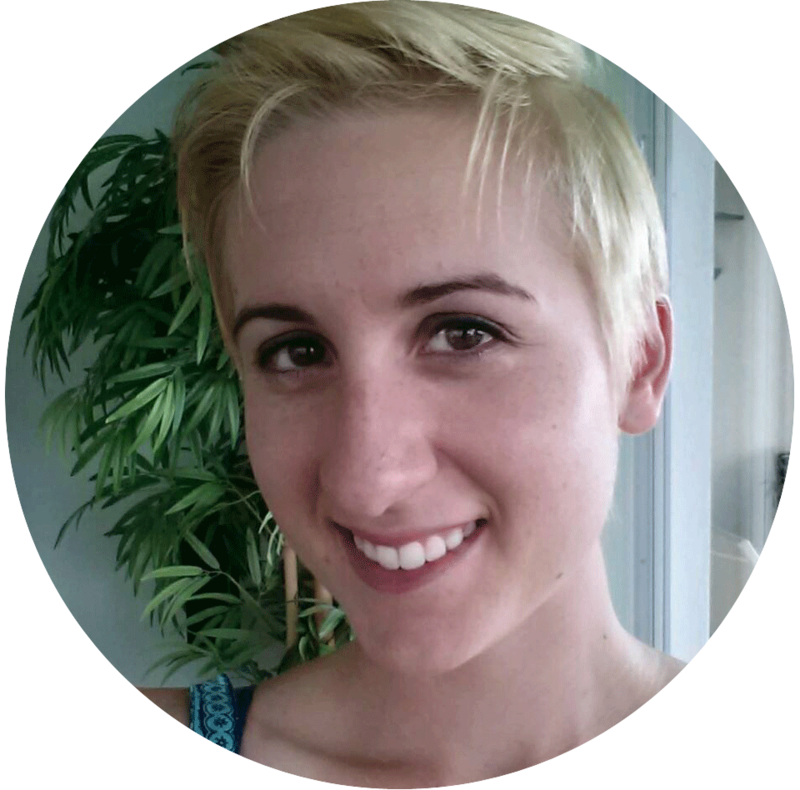 This week I went to my first acupuncture session. I’m always striving to continue improving my digestive and mental health. I’m going to have a whole post about what it was like and how I’m feeling as the sessions go on. But for this week the main suggestion the Dr. had for my diet was no more raw/cold food. That means no more smoothies in the mornings no more salads for a quick meal. Everything must either be entirely cooked or warm. The idea behind this is that your digestion has to use more energy warming up the food you’ve just eaten leaving less energy for the actual digestion. Which can result in IBS type symptoms. I decided to go for a hybrid of a baked apple and an apple crisp to keep it cute and simple (read: portion controlled). Great for parties and if you can, great with ice cream! I definitely recommend these little beautifies. The cinnamon smell will fill your house. The cranberries give it little bursts of sweetness and the honey allows the topping to clump together in that quintessential apple crisp way. Just look at these cuties cut in half! 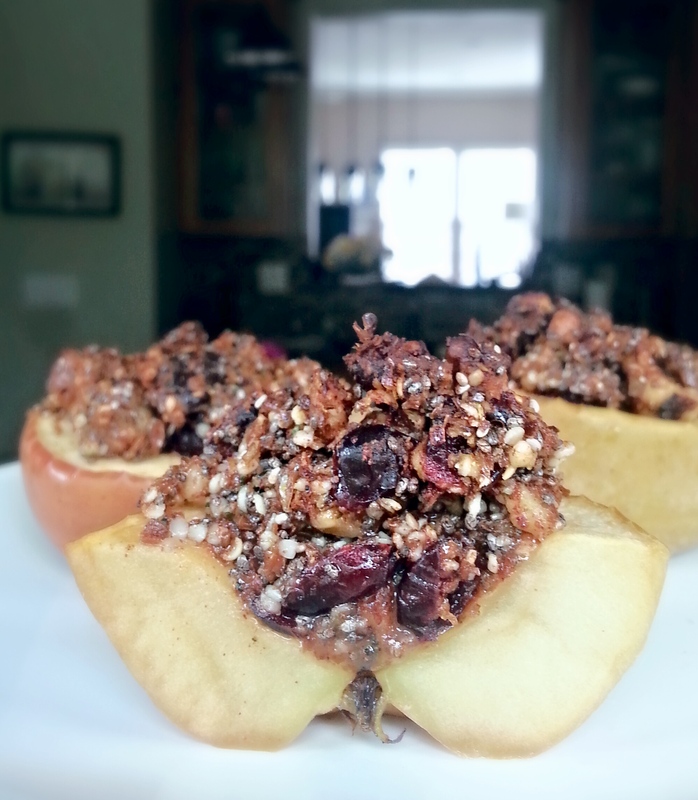 Love baked apples? Going to try and make this recipe? Leave me a comment below! Don’t forget to subscribe at the bottom of this post to get more recipes and special fun directly to your inbox! A mix of a baked apple and apple crisp. 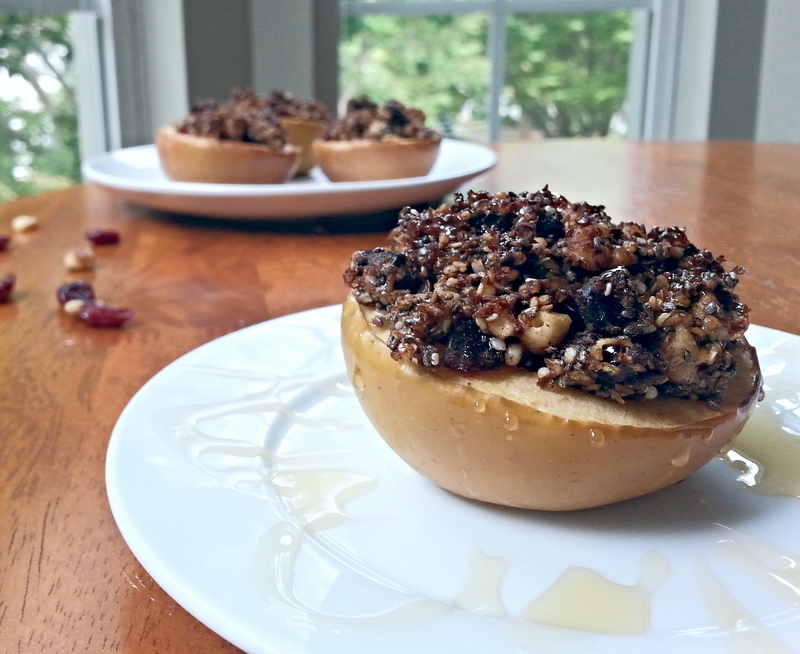 This baked apple is stuffed with a nut and seed mixture held together with honey! Paleo and gluten free. ^ This time frame produces an apple that still has a bit of a bite to it. If you like yours a bit softer try another 5 minutes, but keep an eye on the topping for too much browning. This would be great with ice cream! I love acupuncture! It has helped me a lot in the past. This recipe looks just perfect for Fall. Thanks for sharing! I have my second session tomorrow! But I’ve already seen a massive change in my digestion just from her suggestion to eat warm/cooked foods. I’m very hopeful! Glad to hear someone else has also enjoyed it. I love cinnamon in fall it makes you feel warm and toasty inside! Yummy!! I can’t wait for fall to make this with the local apples… there’s nothing better! Local is always the tastiest! Thanks for reading! Great idea! I will definitely be trying this! Let me know what you think for sure! Oh my goodness, this looks sooo good. I am pinning for future reference! Found you on blogging boost! I will be back! Love blogging boost! And glad to hear you’ll be returning! Hope you enjoy! This recipe sounds so good and is perfect for the upcoming fall season! Great combination of different nuts and seeds for texture AND nutrition. You could realistically even eat these for breakfast! ….I won’t lie. I ate a couple of these the day after for breakfast. You read my mind! Oh these are going on the table THIS WEEK! I can’t wait!! Ah! Love it! Let me know how you like them! This has me excited for fall! Such great spices. I feel like cinnamon is the quintessential fall spice! 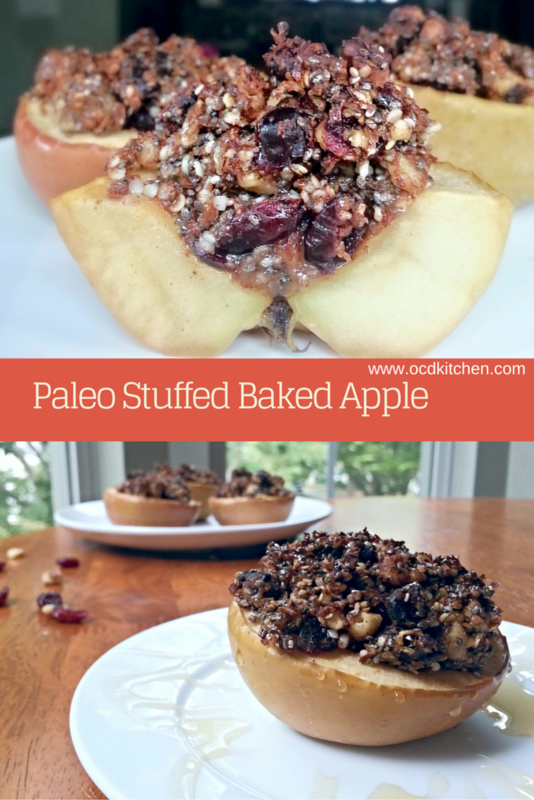 I’m not paleo, but dayyyum, I have got to try that! Also, I didn’t know eating raw/cold breakfast could lead to IBS… Hmm. I don’t eat anything raw for breakfast, excluding the occasional banana, but it’s still something to think about. Let me know how you like them Ginger! These look delish!!! I am gluten free and so these are perfect. I’m impressed that you know what flavors go well together and although you had to make a big switch you figured it out and made something delish! Thanks Nikki! I appreciate that. It’s always fun to try to come up with something that’s still delicious that is allergy/intolerance friendly! Enjoy! Stopping by from #GrowingCirclesHop, I just followed all your social media and would like to invite you to party with me on Friday Features Linky Party this week. 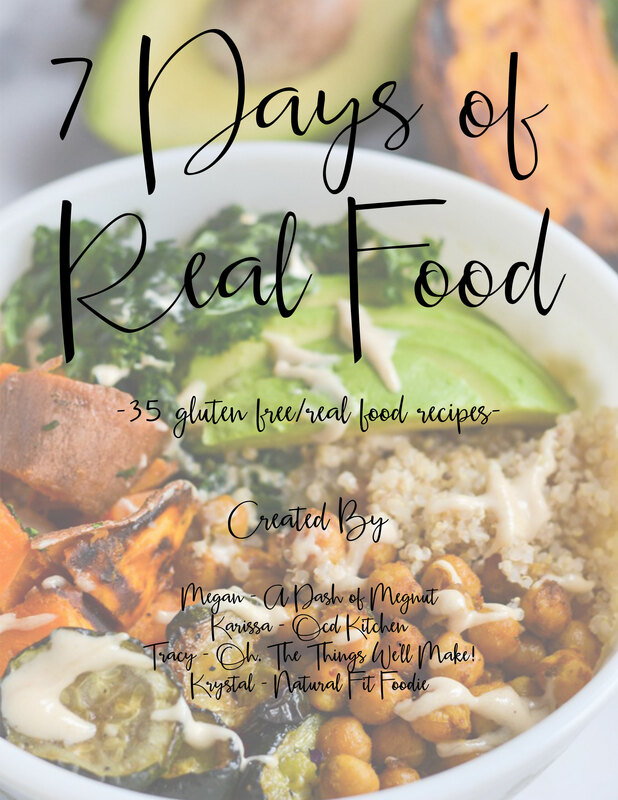 This recipe has all of my favorite things! I will be pinning it to my Apple Board. Thanks for sharing @LearningKidLinkup. Thanks Eva! Appreciate the share! Hope you enjoy! These apples look so delicious! I can’t wait to try them! Thanks for sharing at Inspiration Thursday! Hope to see you tonight at 9 pm est for another party! Thanks Lela! Love sharing at Inspiration Thursday! Wow! plenty of healthy goodness in these. The perfect fall breakfast…or snack or dessert! Yum!! Thanks Jenn! Almost fall season! I was gifted a lot of apples, so I was trying to make different recipes. 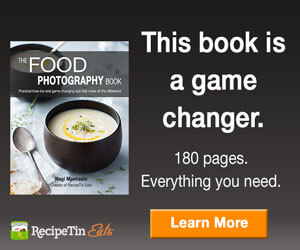 I’m going to try your recipe! That’s great Michelle! Let me know how it turns out for you! Hope to see you again soon! I’m so happy that apple season is upon us. This looks really cozy and comforting. Me too Linda. Bring on fall! I love apples and all things fall! Yum!